The stark beauty of black diamonds has intrigued jewelry designers for decades, offering a striking contrast to their colorless counterparts in rings, necklaces and bracelets. Truly black diamonds, however, are not very common in nature and as a result, the majority in the market are treated to achieve a uniform black color. An important source of black diamonds, both natural and treated, is the Marange deposit in eastern Zimbabwe. It is a relatively new and controversial diamond source yielding large quantities of diamonds with a combination of brown radiation stains and graphite inclusions that make them appear black or give them the ability to be treated to achieve that color. The source was discovered in 2001 by De Beers but not worked until 2006. A 2018 study by GIA researchers Karen V. Smit, Elina Myagkaya, Stephanie Persaud and Wuyi Wang reports in detail on the unique properties used to identify the color origin of Zimbabwe black diamonds and how to identify potential treatments. 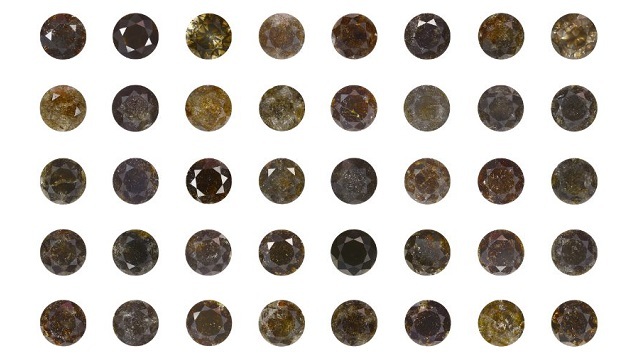 Table-up images of the 40 natural Fancy Dark brown to Fancy black Marange diamonds from this study. The diamonds range between 0.39 and 3.11 ct, and between 4.47 and 8.75 mm in diameter (see table 1). All the diamonds have a dark appearance due to graphite needles and abundant radiation stains, except for four with dark clouds comprised of micron-sized inclusions of graphite. Photos by Jian Xin (Jae) Liao. The GIA researchers analyzed a suite of 40 natural Fancy Dark brown to Fancy black diamonds, weighing 0.39 carats to 3.11 carats, for the study published in the Summer 2018 edition of Gems & Gemology, GIA’s quarterly professional journal. All of the round cut diamonds were acquired from the trade polished and untreated. Photos show that the color is distributed unevenly in the majority of them, making them less suitable or unsuitable for jewelry. The researchers subjected the diamonds to various tests, including several different spectroscopy methods to identify impurities and defects in the diamond crystal lattice. Inclusions (such as graphite) are normally distinguished from defects such as GR1, an irradiation-related defect that is also reviewed in the paper. DiamondView imaging was used to map the growth zoning. DiamondView and visible light images of two diamonds that show radiation stains within fractures in the diamond. Non-luminescent regions in the DiamondView images are associated with extensive radiation damage along fractures in the diamonds. Photos and images by Karen Smit. The black hue in many naturally colored diamonds is caused either by exposure to radiation or by inclusions of sulfides, graphite, magnetite, hematite or iron-bearing materials. Many treated black diamonds are so heavily irradiated that they look black, but instead are extremely dark green. The dark color in the Zimbabwe samples is caused by inclusions of graphite, methane or other dark minerals that are so prevalent within the stone that all or most of the diamond takes on that color. A number of them also contained brown colored radiation stains centered in the fractures. The GIA researchers found that the majority of their Marange samples derived their dark colors from the abundant graphite needles and brown radiation stains in large fractures that reached the surface. 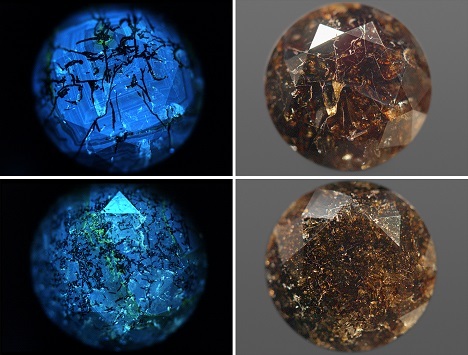 The brown stains are likely the result of the diamonds residing at the Earth’s surface for at least 1 billion years and their exposure to radioactive fluids and minerals. While most diamonds exposed to radiation turn green, after heating to around 500-600°C these stains turn brown. While the fractured diamond probably would not survive the HPHT treatment process, they could withstand low pressure, high temperature treatment to turn them into gem-quality black diamonds. Four of the samples had an unusual internal structure – they contained two different growth structures, octahedral and cuboid, which are called mixed-habit diamonds. The cuboid area of the diamonds had clusters of micron-sized graphite inclusions that appeared as a dark cloud. Another GIA study has shown that when heated above 1200°C, however, the graphite inclusions expand to 10 to 16 times their original size, that can create a uniform opaque black color. This makes Marange a potentially important source for treated fancy black diamonds. The aim of the study was both to document the properties of black diamonds from Marange and to better understand how such unusual diamonds were formed. Because Marange produces a large amount of diamonds – several million carats yearly – these lower-quality graphite-containing diamonds represent a potentially major source for both treated and untreated black diamonds – especially because they tend to be larger than average run-of-mine diamonds, 5 to 7 carats. 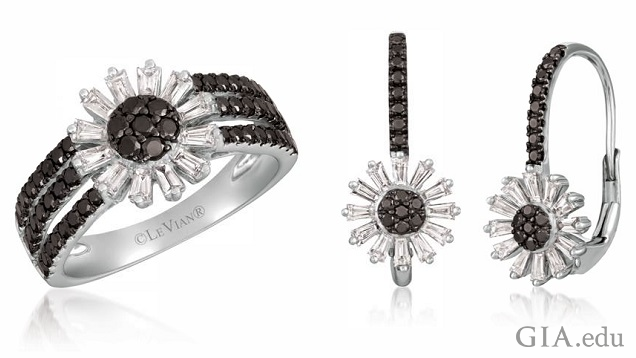 Le Vian’s Sunflower Collection features black diamonds, which it calls Blackberry Diamonds®, and colorless diamonds, which it calls Vanilla Diamonds®. 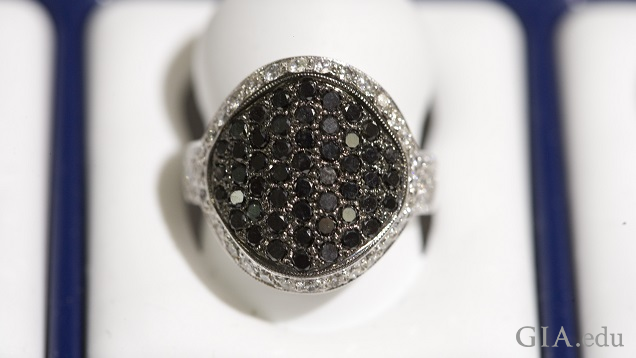 The ring, left, features .625 carats black diamonds and .375 carats colorless diamonds set in 14K gold. 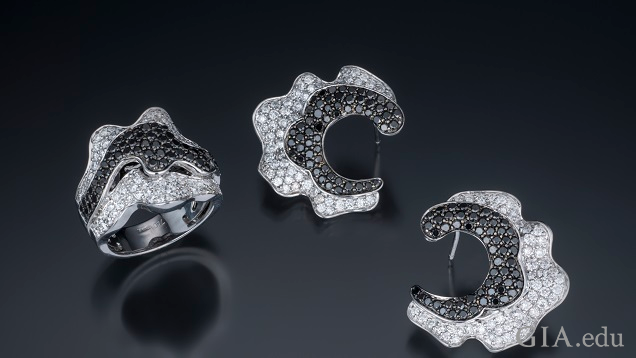 The earrings feature .25 carats black diamonds and .625 carats of colorless diamonds. Photos courtesy of Le Vian. Lead author Karen V. Smit and a different team of researchers examined another group of mixed-habit diamonds from the same deposit to better understand diamond growth processes. The mixed-habit diamonds contained inclusions of ancient fluids of methane (carbon and four hydrogens). The study conducted by Smit, Steven B. Shirey, Richard A. Stern, Andrew Steele and Wuyi Wang appeared in the April 2016 issue of Lithos. Interestingly, these methane fluids were only located in the cuboid sectors of the diamonds, while the octahedral portions were free of them, due to the much faster growth rate of the cuboid sectors relative to the octahedral. These Marange diamonds are the first diamonds in which methane has been described, and has provided important constraints on how diamonds form in the deep Earth. Lead author Karen Smit is a research scientist at GIA in New York. She received her doctorate in geology from the University of Alberta in 2013 and was a postdoctoral research fellow at GIA from 2014–2016. Her areas of study are diamond geology and geochemistry; she has published extensively in Gems & Gemology and other journals, most recently in Minerals and Petrology on Neoproterozoic lherzolitic diamonds from the Victor Mine in Canada. Stephanie Persaud is an analytics technician at GIA in New York, with expertise in UV-VIS, FTIR, photoluminescence and Raman spectroscopy, and diamond color origin. She contributed to articles in Gems & Gemology on screening loose melee and the use of GIA’s iD100 . Elina Myagkaya is a research lab technician, at GIA’s lab in New York, responsible for data collection including UV-Visible, infrared, Raman, and photoluminescence spectra, and instrumentation maintenance of the lab equipment. She contributed to an article in Gems & Gemology on laboratory-grown green diamonds and to a paper presented at the 2018 GSA conference on freshwater cultured pearls . Wuyi Wang is GIA’s vice president of research and development. He received his Ph.D. in geology from the University of Tsukuba, Japan and his published research includes diamond geology and geochemistry; HPHT experimentation; identification of diamond treatments and synthesis; gemology and mineralogy of colored stones. The Gem Testing Laboratory in Jaipur identified a black diamond-like specimen as boron carbide, a ceramic material typically used in nuclear, military, and aerospace applications. Testing reveals the first synthetic nano-polycrystalline diamond (NPD) to be detected by a gem lab. DiamondView is used to identify a Fancy black natural diamond from its NPD synthetic counterparts.